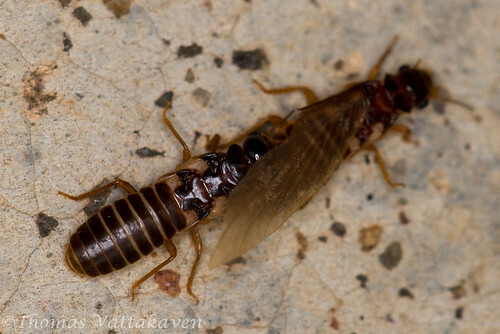 A characteristic event that occurs with the onset of the monsoon is the swarming of termites. 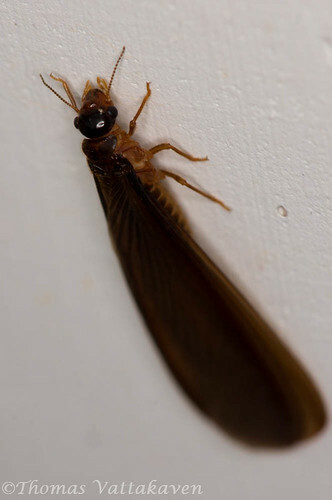 Termite swarming typically occurs at dusk and continues into the night, when thousands of winged males and females emerge from a single or multiple underground nests to mate. The morning after though, all the vibrant activity is gone and all that is left are thousands of dead and dying individuals and their countless wings. 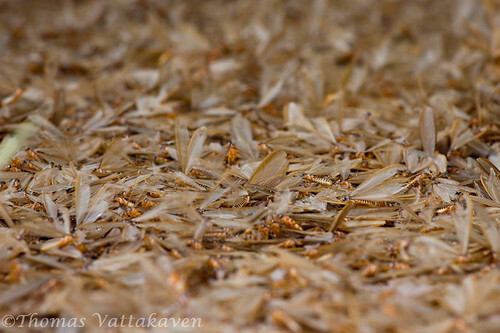 These are some images taken the day after a massive swarming of termites had occurred. 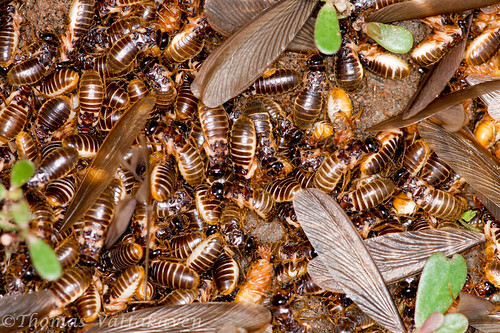 The termites are much like ants and bees and live a social, stratified life with a king and a queen and multitudes of workers and soldiers. 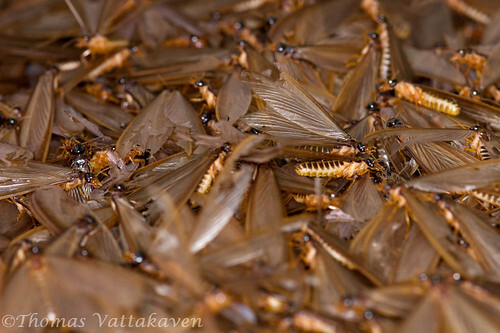 Once the queen has laid her initial batch of eggs, tended and hatched it, the resulting workers take over the nest duties and care for her. 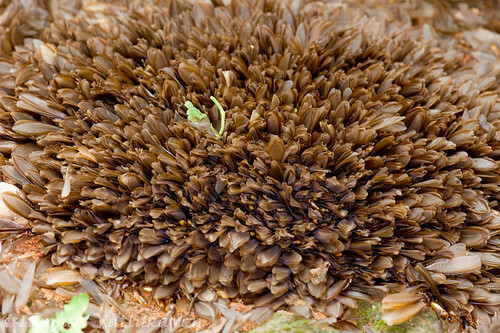 She then becomes an egg laying machine and concentrates on increasing the colony numbers, producing thousands of eggs every year for up to a decade. 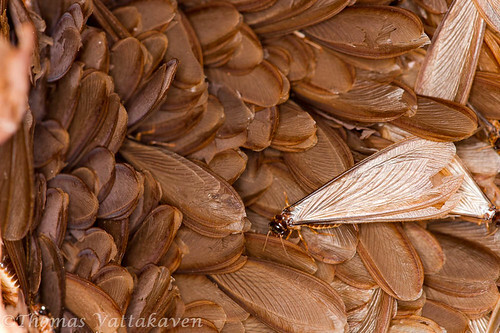 From these eggs hatch not only sterile workers and soldiers which help maintain the colony and defend the nest against enemies like ants, but also male and female termites, which are ready to fly away and start kingdoms of their own. 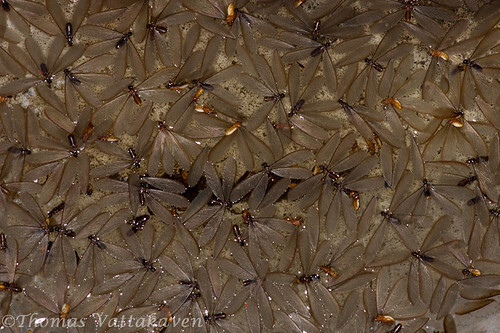 Several times a year, when there occurs the right combination of humidity, temperature, light, barometric pressure and wind speed, the males and females leave their home in a swarm, with thousands of aspiring queens and kings, taking flight. 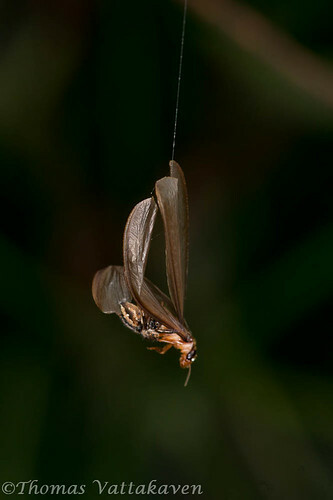 The females produce a fragrance which attract the males and the two mate, perform a nuptial mating flight. 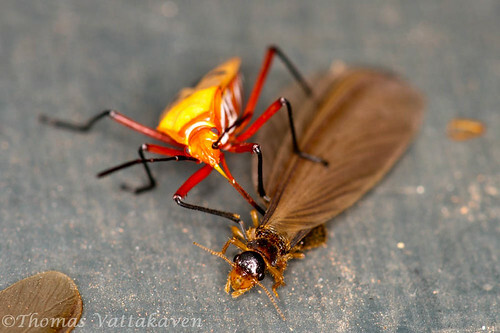 The pair then settle to the ground, lose their wings and dig a chamber in the soil or in moist wood and mate within it. Unfortunately (or fortunately) out of the thousands of mating pairs, only a handful will succeed in their mission to mate and reproduce. they have less than one in a hundred chance. What happens to the remaining individuals are what is featured here. 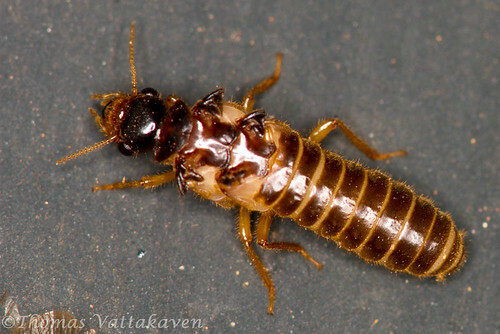 Most of the individual get attracted to streetlights and other light sources and end up falling flat (literally) into a heap of dying termites. some others meet a watery end as their long wings are easily wet by water and entrap the individuals. It is a common sight to see open vessels full of termites the morning after a monsoon rain in Kerala. However, while one might wonder why so much waste of life and bio matter might occur, nature has its own reasons. 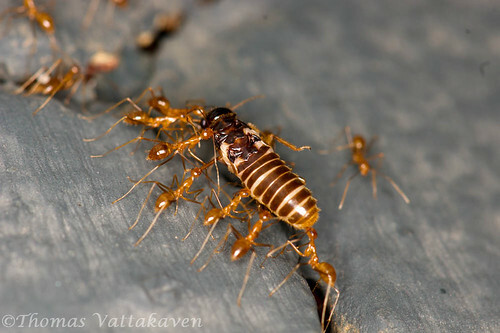 When one observes closely, it is not difficult to see that swarming in termites may be nature’s way of providing countless predators with a free meal and a supplement of protein! 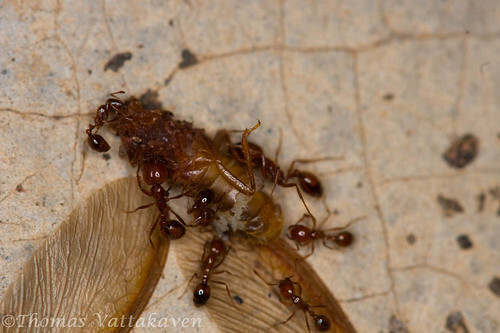 Ants are what spring to mind first…after all, they are the traditional enemies of termites, just walking around my backyard, I was able to see different ant species both big and small, carrying home the loot. 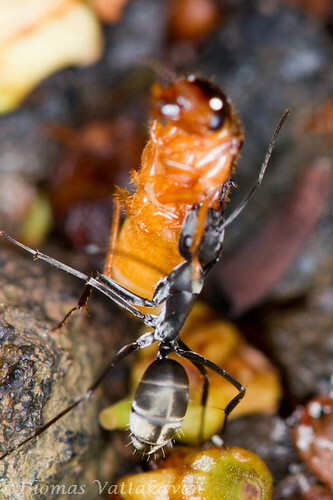 Within a single nights swarming, the ants can gain more food than they would otherwise accumulate in weeks. 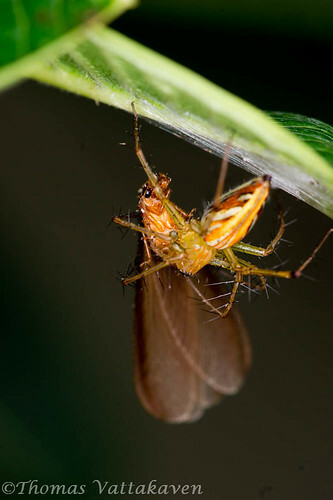 Spiders are no less busy, both web spinners and stalking spiders have their hands (legs) full. 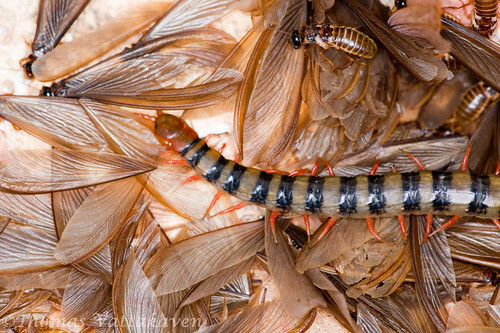 Predatory insects like centipedes wander around, picking and choosing the individuals to feed on. 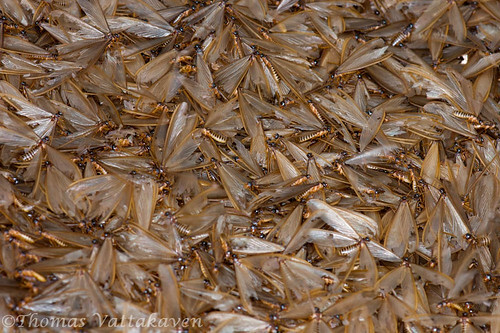 The mass of struggling termites also attracts other predatory insects not usually seen here. 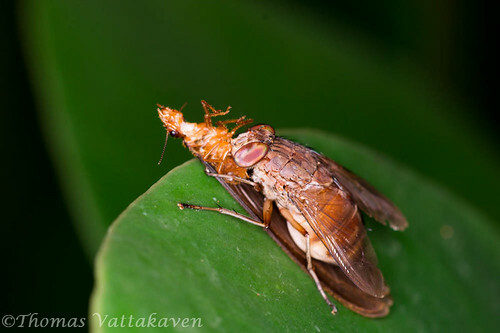 In short, the insect predators have an easy meal on the morning after. However, it is not the insects alone that benefit. 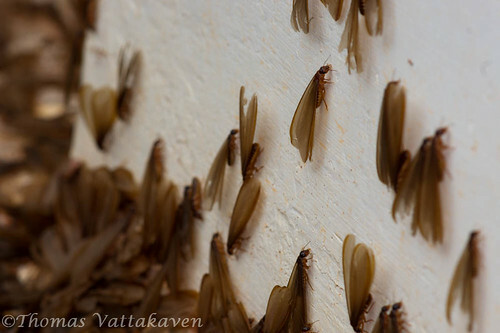 Birds stay up late during swarming, feasting on the termites as they rise into the air. They also pick out the grounded individuals on the morning after. Bats and small insectivorous mammals feed on them by night. Lizards gorge themselves to the point of bursting! All in all, there may be millions of death but it goes towards supporting life. Nothing in nature goes waste. 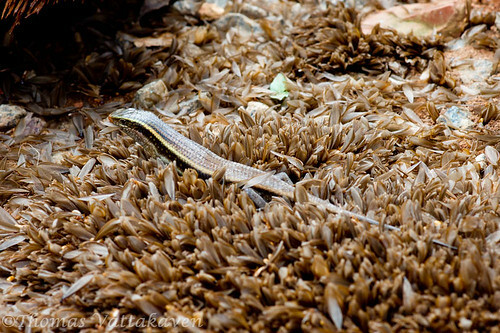 Excellent series of images, especially the last one with the lizard facing towards the camera. Thank you Kerry. 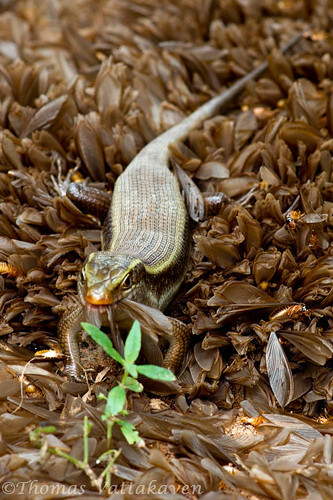 That lizard was so engrossed in muching up the termites that he didnt mind at all when I crept up to him!